Have you ever wanted to win a Christmas parade or cut out the hundreds of hours of preparation to make a float for a parade which really stands out? Christmas Décor has the ability to provide lights, trailer beds, equipment and trucks to have a custom made float or boat to really catch one’s attention or be an advertisement in a parade. Our Christmas Light Parade Float Wins 1st Place! This can be a turnkey process all the way up to a full consultation and implementation. 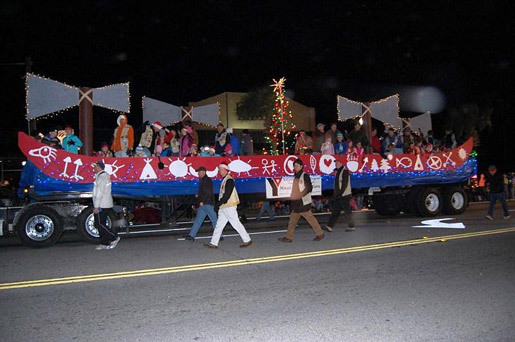 Your Christmas Parade Float can be leased from us- we will come up with a custom design which will require little to no work on your part. Our design team will come up with a design, build the float for you and then drop it at the location. All you need to do is show up for the parade. 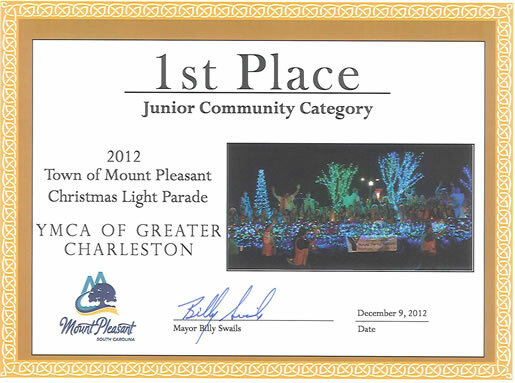 Here is a picture that we won at a recent 2011 Charleston area parade for the YMCA. Call Now 1-800-900-9314 or Fill Out simple form. There are plenty of themes that would benefit from having a float. Examples are the following: Christmas Parade or Holiday Parade, New Year’s Parade, St. Patty’s Day Parade, Easter Parade, 4th of July Parade, Mayday Parade, Graduation Floats and Parade, Halloween Parade, Mardi Gras Parade, Sports Parade, Spring Parade, Fall Harvest Parade, Winter Parade, Oktoberfest Parade, Children’s Day Parade, and there are numerous parades for special interest groups and communities all over. Example of Ideas for a Floats include the following: Christmas Parade and a white Winter Wonderland theme, New Year’s parade with a larger than life scroll with New Year’s Resolutions with quality of life and family time being the focus, Saint Patty’s Day Parade with a Leprechaun making shoes and being mischievous, 4th of July Parade emphasizing beach activities and All-American fun, etc. These floats do not have to be a one-time use, but can be dissembled and later reassembled with or without modifications to it. If you already have an existing float we have certified electricians that can add more power, change existing wiring, add power inverters, LED lights, generators and such. Most of the equipment is leasable unless your float design requires custom made items only usable with your design. If you are a participant or a sponsor for a parade in South Carolina and need help with a float or parade feel free to give us a call and find out what we can do to make your special event happen. Below are a list of Festivals and Parades that occur in South Carolina. Even if you are not in the actual parade you might like to see parades that are available to you and your family in our lovely state of South Carolina. Visit our parade page for some of the upcoming parades listed for September through December. Look for more to be added as the seasons change.